Seeking to reduce the use of water in the refining process and as a way of minimising its environmental impact on the North Saskatchewan River, North West Redwater (NWR) Partnership turned to GE’s Water & Process Technologies for NWR’s new Sturgeon refinery in Alberta, Canada. Like many regions, Alberta has very stringent regulations regarding freshwater withdrawal and effluent discharge, and Water & Process Technologies provided an innovative solution to meet NWR’s sustainability and environmental goals as well as the province’s policies. To minimise the use of freshwater, Water & Process Technologies will provide efficient water treatment systems with process water from the refinery being treated and recycled multiple times. Surface water runoff from the facility will be contained in the retention ponds and used for process purposes to reduce the water withdrawal from the North Saskatchewan River. The ultrafiltration and membrane bioreactor technology allow NWR to meet its unique recycling challenges. Chemistry and on-site technical support from Water & Process Technologies will not only ensure that the facilities’ water balance targets are met, but also will maintain the reliability of its various assets by protecting from deposition and corrosion. “The Sturgeon refinery is the first new refining facility to be built in Canada in almost 30 years’ time. For this greenfield project, it is our mission to process Alberta bitumen to add value to this local resource, but to do so in a responsible and sustainable manner. With the help of GE’s water and wastewater chemical treatment technologies, the Sturgeon refinery project will enable us to recycle wastewater and meet stringent discharge regulations,” says Kerry Margetts, chief operating officer, North West Redwater Partnership. The Sturgeon refinery project is the world’s only refinery designed from the ground up to incorporate gasification and a carbon capture and storage solution while producing the cleaner, high-value products needed to meet North America’s new low-carbon standards. NWR undertook a collaborative approach to project development and selected companies with best-in-class technologies, vetting them to ensure commercial competitiveness within their respective areas of expertise. NWR then partnered with the selected organisations to develop a fit-for-purpose design. This unique approach eliminated costly redesign steps for a project of this nature, thus reducing project cost and improving the overall project schedule. “Oil processing and production requires an enormous amount of water. By treating the plant’s wastewater and recycling it for reuse within the refinery, NWR will decrease its freshwater dependency on the North Saskatchewan River and refine the widely available bitumen in an environmentally friendly and responsible way,” says Amy Ericson, global leader, chemical and monitoring solutions – GE’s Water & Process Technologies. 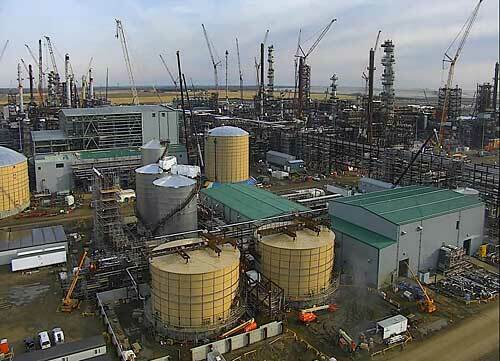 Phase one of the Sturgeon refinery will process 50,000 barrels of bitumen per day. The project will utilise gasification technology to capture pure CO2 during the refining process, which will then be sold as feedstock to Enhance Energy Inc., whose Alberta carbon trunk line will use the feedstock for enhanced oil recovery before safely storing the CO2 deep underground. The refinery is expected to be operational in 2017.